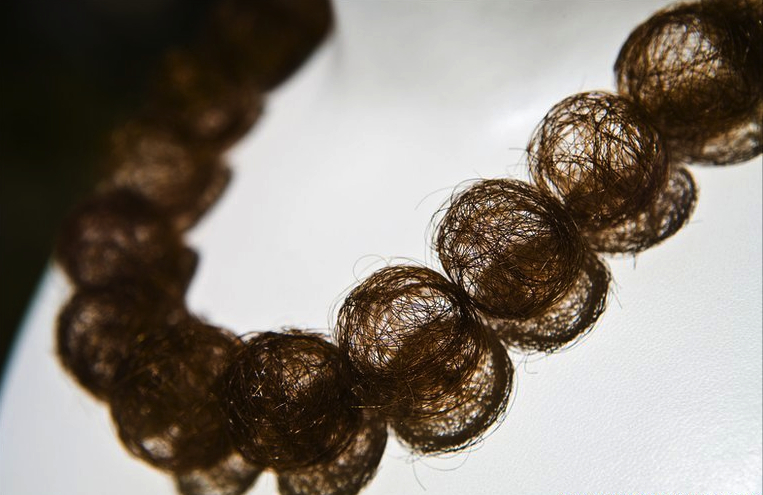 At first glance, especially through the window of an expensive jewellery shop*, Mona Hatoum’s Hair Necklace might appear to be delicate beads made of spun metal thread. A closer look – or knowing the name of the piece – would immediately give the game away though and this delicately beautiful necklace would immediately become somewhat less appealing. A single string of beads as a necklace isn’t exactly unusual. And the idea of carrying a lock of a loved one’s hair in a necklace, specifically a locket, is hardly new. Combine the two ideas though and you get something rather less commonplace and much more interesting. 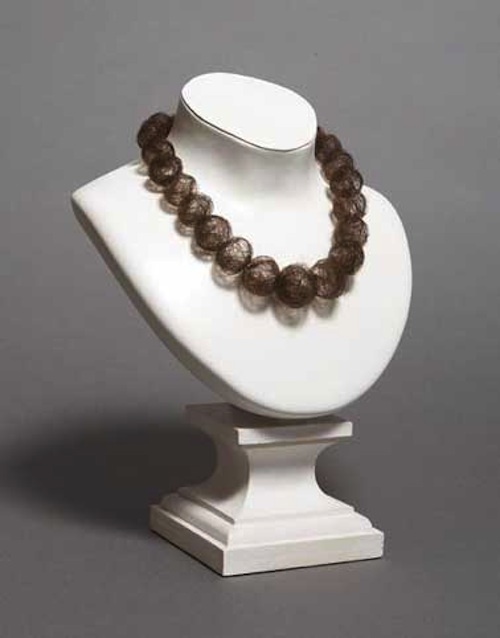 Hatoum’s hairball beads are undeniably beautiful. There is an extraordinary filigree delicacy to them. Nonetheless, those odd stray ends disturb. And the realisation that this is hair – real hair – inevitably offsets the aesthetic appeal. There’s just something about hair. Beautiful as long as it stays on the head, detached – especially from the head of a stranger – it immediately gains the power to disgust. I’m generally fascinated rather than freaked out by hair; I’ve used it in work myself and don’t baulk at it in the work of others to the extent that many do. But its status as something we encounter on both sides of the desire and disgust dichotomy and its associations with fairy tales and spells gives it real power, power that Hatoum has used to great effect. * I didn’t see it in this context, but the necklace was shown (first, I think) in Cartier in Bordeaux. This entry was posted in Sculpture and tagged art, hair, Hair Necklace, jewellery, Mona Hatoum, sculpture by Ann Jones. Bookmark the permalink. That’s a horribly evocative description! The pube thing is the extreme of the hair disgust spectrum but I think even silky strands of hair gain the power to disgust once detached from the head. I guess it’s that cut hair is one thing (so the lock of hair or something made from cut strands is fine) and shed hair quite another. The hairballs in the necklace feel closer to the hair you might find in a plughole than a deliberately cut tress. Yes, that’s probably it. ‘Shed’ vs ‘sheared’. (Although that doesn’t work with toenails, does it?) Many, many apologies for the unsavoury mention of you know who. Brrrrr. Ha! No, it definitely doesn’t work with toenails (which should eally not be considered as art materials under any circumstances; something David Shrigley has amply demonstrated). I’ve used hair a few times too – but always photographic. It still has the power to disgust. Generally I love her work – I saw her give a great talk here not too long ago. This would have been neat to see in the context of Cartier – it brings up the idea of the lock of hair for sure. I’ve never heard Mona Hatoum talk about her work; I’m really envious of you about that! This is awesome. Can’t say I’d ever wear it (I’m one of those people that likes hair to remain on heads), but it’s a sweet necklace either way. The idea of wearing it is where the disgust really kicks in for me, I think. It makes my skin crawl a bit.